We probably know people who exhaust us by their meaningless prattle or baseless grumbling or senseless demands. Knowing their nature, we often avoid or at least minimize their company. We need to adopt a similar proactive approach for dealing with our mind, because it too exhausts us by its unnecessary, unintelligent or unhealthy propositions. The Bhagavad-gita (06.06) warns us that the undisciplined mind is our worst enemy. The mind’s tiresomeness is far more insidious than that of tiresome people because it deludes us into misidentifying with it. Consequently, we accept its ideas as our ideas and thereafter slave to act according to its dreams and schemes. 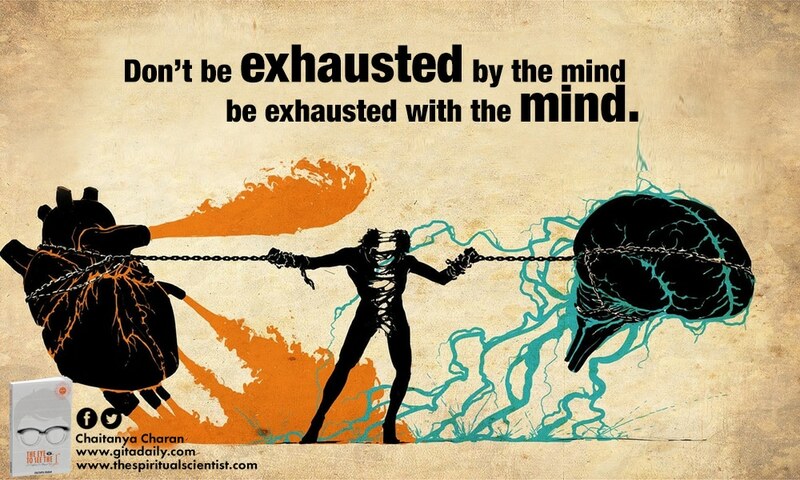 Thus, we become exhausted by the mind, that is, the mind wears us out just as a taskmaster wears out a slave. Gita wisdom shows the way out of such exhaustion: become exhausted with the mind. To intellectually disabuse us of our mental misidentification, it provides penetrating philosophical explanation of our actual identity as souls, parts of Krishna. To practically counter the mind’s spell, it provides us the eminently accessible process of bhakti-yoga. When we engage ourselves in devotional activities, we gradually realize spiritual happiness to be far richer, deeper and sweeter than the pleasures offered by the mind. The more we relish such higher happiness, the more we realize the mind’s suggestions to be happiness-deprivers, not happiness-providers. Thus we become exhausted with the mind. That is, we understand that because it has wasted so much of our time, lifetime after lifetime, it no longer deserves our unquestioning trust. Equipped with this healthy skepticism, we can proactively distance ourselves from the mind and practice bhakti-yoga wholeheartedly. Such practice is rejuvenating – instead of finding ourselves exhausted by the inner battle with the mind, we find ourselves recharged by our energizing inner connection with Krishna.